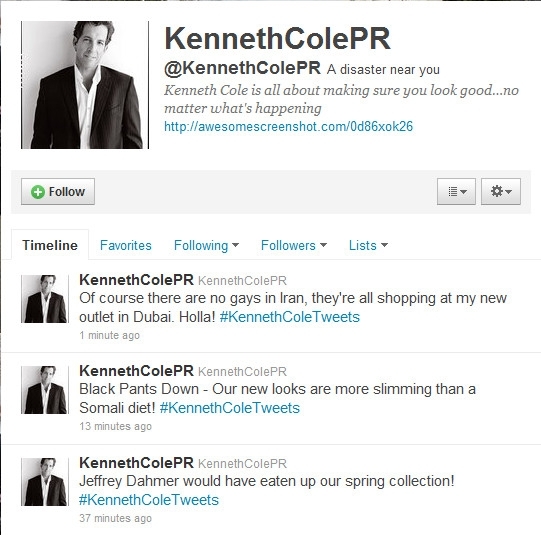 UPDATE: Check out my follow up post on ways Kenneth Cole could have avoided Tweet-Hell! What was surely meant to be a humorous tweet, quickly became blown up and criticized by just about every media outlet that exists. Note the "-KC" at the end of the tweet indicating that it actually came from the big KC himself. That makes it even worse. Really? Do you really understand the sensitivity of this historic moment and that people are dying? If so, why would you send the first tweet at all? 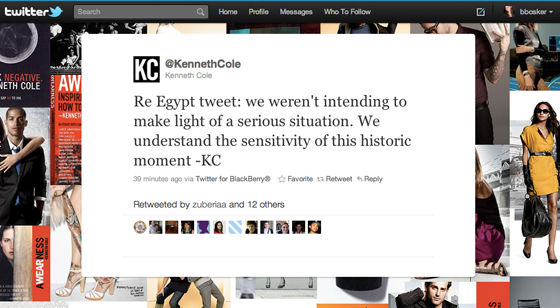 I apologize to everyone who was offended by my insensitive tweet about the situation in Egypt. I’ve dedicated my life to raising awareness about serious social issues, and in hindsight my attempt at humor regarding a nation liberating themselves against oppression was poorly timed and absolutely inappropriate. 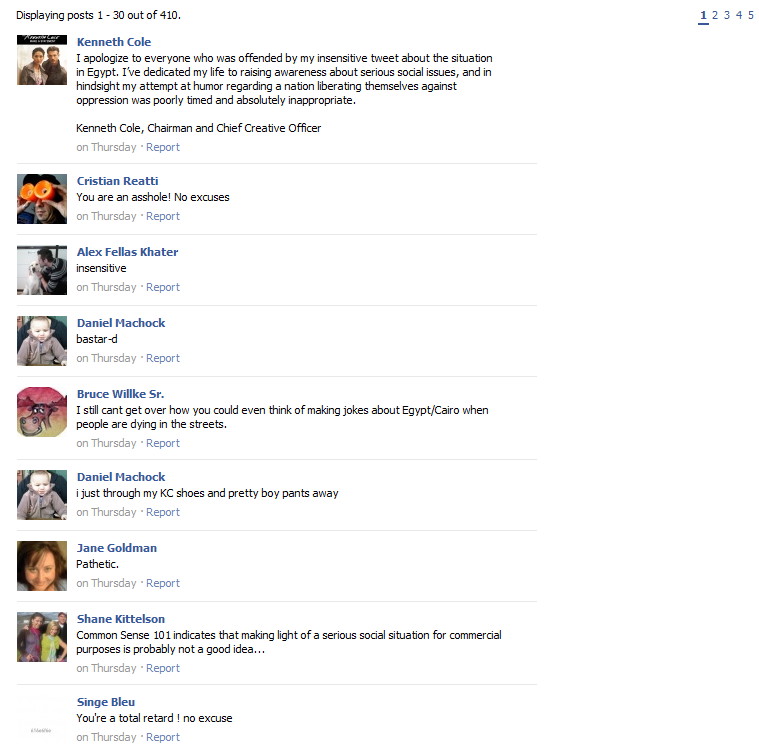 As you can see, this is only page one of the responses. Not good. Clearly these tweets are not helping the situation. I can't wait to hear what Saturday Night Live has to say about all of this their Weekend Update. In the past, we've touched on the importance of having a social media policy for your business. We've consulted with many small businesses to establish social policies that protect against instances such as these. We would be happy to help you establish a policy for employees that represent your company in the various social media outlets. What Impact Did It Have On the Kenneth Cole Business? 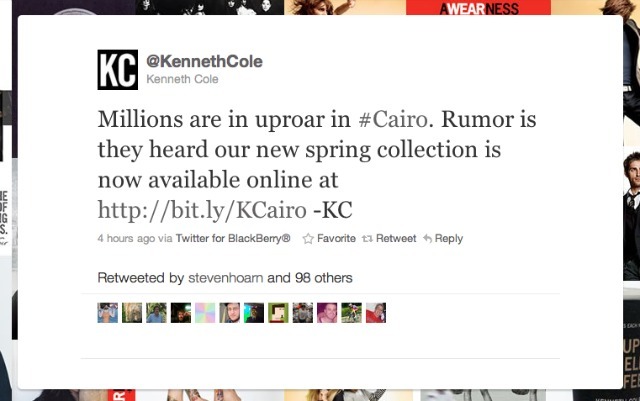 While their's probably no one that will argue with the fact that the tweet was very distasteful and clearly not well thought out, I think as a Social Media and small business marketing firm, we need to look at how it effects the Kenneth Cole business. I'm sure you've heard the saying, "any press is good press". Do you think it applies here? On one hand, I have to say, I would have never even thought about looking at Kenneth Cole's spring collection if all of this wouldn't have happened. I'm not into the fashion industry personally. On the other hand, it certainly puts a bad taste in my mouth when it comes to the Kenneth Cole brand. So, I think it boils down to whether the immense social spread/TV segment activity/Inevitable magazine articles/and general news coverage of the infamous tweet ultimately boosts their brand recognition to a point that increases sales considerably, versus tarnishing their reputation beyond repair. Only time will tell... I would love to hear your opinions in the comments below or on Facebook or Twitter.